Green Belts – visit – http://www.naturenet.net/status/greenbelt.html for more information but they are usually elements of national planning policy, expressed through County Structure Plans. However, there are various different measures and schemes which have been referred to as ‘Green Belt’ and not all of them are the same. The biggest Green Belt in the UK is known as the Metropolitan Green Belt, around London. There are other major green belts around the West Midlands conurbation, Manchester, Liverpool, and in South and West Yorkshire. This principle was established in 1955. Furthermore, green belts are growing still. Between 1979 and 1993 the green belt area designated in England doubled. • To check the unrestricted sprawl of built-up areas. • To safeguard the surrounding countryside from further encroachment. • To prevent neighbouring towns from merging into one another. • To preserve the special character of historic towns. • To assist in urban regeneration. These form a continuous ~Green Belt area which form part of the London Loop series of footpaths around London. We are hoping that when the Cane Hill Development is constructed that the Green Belt on this site will have a number of new footpaths, bridle ways and cycle route, opeing the area up to the public. The site lets you know of the ACCS members Groups; The Green Croydon Leaflet’; Croydon’s Countryside; Wildlife ares in Croydon; Volunterring and Events; and how to contact them. Well woth while for a visit. Alistair Hayes presented to the Friends of Farthing Dowsn AGM and is trying to get funding from the National Lottery to protect this area of the North Downs and resist the pressure for housing on the Green Belt. All quiet on the eastern front – New National Planning Guidance and the Green Belt. The palaver which is engulfing the proposed new national planning guidance seems to be by passing Croydon. The fuss, nationally, is whether draft official guidelines in effect encourage and favour land speculators – because of wording which “presumes in favour of development”. There is a secondary ‘sub-text’ which also hints that greenbelt land could be up for grabs because the drafters only talk of preserving areas of national beauty and amenity. Present greenbelt guidance on the other hand sees value in having much ‘ordinary’ land designated greenbelt to prevent urban sprawl (something the greenbelts have done successfully for over forty years). Why then the deafening silence in Croydon regarding both counts? The ‘eastern front’ of the borough after all is predominantly greenbelt (in fact over a third of the whole borough is so designated, and has been protected as such for over twenty years in successive land-use plans). Yet currently there is scarcely a rumour about land speculation, nor seemingly any hint of people trying to flout the rules on refurbishing houses, farm properties, storage places and the like, in designated greenbelt areas. Yet elsewhere on the periphery of Greater London, there seems to be much concern. It was voiced at the November 2011 meeting of the London Greenbelt Council (ECRA is a member; I am its rep). Things such as rebuilding houses to include extensive basements or large balconies to get round floorspace limitation rules; or bringing into an area 470,000 cubic metres of waste to layout a new golf course; or developing a marina alongside a canal as it crosses a greenbelt; or greatly extending a lorry park … Some councils it seems are excluding land from the greenbelt ahead of their adoption of new local frameworks. Others apparently do not even have a draft framework against which to assess issues! Croydon of course does have a draft core strategy to cover its long-term planning, and that says the council will stand by its extensive metropolitan greenbelt commitments. But three things, at the very least, have to be borne in mind here. One. Croydon’s population is growing steadily – compared certainly with twenty years ago. And faster than most other boroughs. Its own figures show that land supply will taper quite sharply ….. Two. The core strategy says ‘community gardens’ (meaning minor open space, allotments, and private gardens) are so badly distributed across the borough – and especially in the south and east – that some adjustment has got to occur. 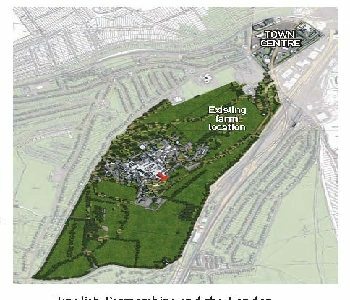 What is the betting that an argument will arise to swop greenbelt for community open space? Thirdly, we have to reckon with the fact that the credit crunch has put a temporary stop to commercial land speculation. A lull that could soon change. In consequence ECRA, other residents’ associations, and community groups need to remain watchful of policy development over the next little while, in defence of the greenbelt. We have been here before. 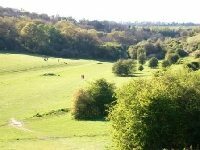 In 2003, land adjacent to Farthing Downs, either side of Woodplace Lane was put up for sale by the Council (the guardian of the Greenbelt!) to help meet its cashflow problems. Campaigning by a Community Action Group raised sufficient monies to enable the City of London Corporation to buy Woodplace Fields and add them to the open Downs. The remaining acres are now in the land bank of a foreign development company that is doubtless waiting for the slightest hint of a policy ‘presuming in favour of development’. Of course it’s one thing for neighbours to swing into action to defend a piece of greenbelt when a specific threat appears. Quite another to be continually mindful of all the issues involved in conserving open space immediately adjacent to a heavily built up area. 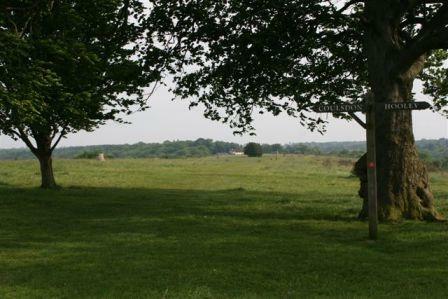 Following the to-do over the Downs, two community groups formed to link with the City Corporation for precisely that purpose: Friends of Farthing Downs; and Friends of Kenley Aerodrome. Each embryo group is working out how best its local community might be part of activity that will heighten awareness of what these greenbelt areas mean; their flora and fauna, animal and herd welfare; hedging; ditching; and the care of tracks and routeways. The Corporation is anxious to involve volunteers alongside its small cadre of rangers, building on what Hill Billies have pioneered in the Old Coulsdon stretch of the Downs. All this in time should alter current perspectives on greenbelts: from just stopping sprawl, and keeping in aspic those stretches that are of particular landscape, scientific or historic value, towards how best urban dwellers can utilise, enjoy, yet sustain green spaces on one’s doorstep. We have scarcely begun this journey. The crucible for testing this symbiosis is however now at hand. For over twenty years the asylum on the crest of Cane Hill, closely adjacent to Coulsdon town centre, has lain derelict. A masterplan, now in the making, envisages building about 700 dwellings within the footprint of the old hospital, while making the whole area accessible from the central shopping area. Cane Hill, together with highrise stuff in central Croydon, are the principal two zones through which Croydon Council aims to meet the borough’s housing need. Principles of positive conservation combined with much usage are going to be severely tested. Noisiness on the eastern front is about to begin. Be prepared! Cane Hill – is designated as Green Belt land which is due for development. However the London Borough of Croydon has desinated that this development cannot be of a greater footprint than that of the old Hospital site, albeit that this does not have to be contained to where the old buildings were. The developer, English Partnership ( now The Homes and Communities Agency (HCA) says the scheme will provide new jobs and homes for local people whilst respecting and improving the existing environment. It is important that our proposals are being developed within the site’s Green Belt planning designation and we recognise the environmental importance of the Cane Hill site to the local community. They are consulting with residents on the possible options.